Simply having an open dental practice isn’t enough these days when it comes to generating successful leads. Unfortunately, it’s not always easy to do, especially if you’re relying on a new dental lead or two through a couple of your regular patients referring their friends and family. The best way to generate new dental leads to your practice is to have a multi-tiered approach. 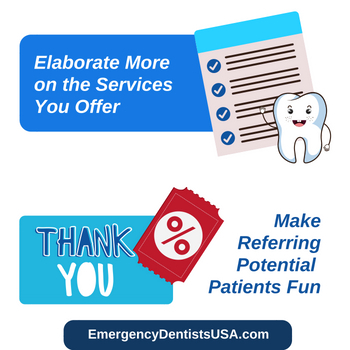 Relying on your patients to refer new patients to your practice isn’t realistic, which is why it’s so important to have a number of different dental referral ideas on the table. There are so many different ways to generate new leads and overall referrals to your dental practice. Gone are the days where relying on patients to refer their friends and family members for new patients was your only option! If you’re the type of dentist who expects their patients to refer their friends and family to your practice without verbally asking them to do so, you’re not exactly asking them in the right way. However, this is only something you should be doing with your long-term patients, not patients you’ve seen only once or twice. 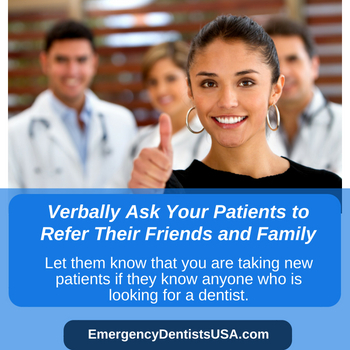 When your patient is about to leave, let them know that you are taking new patients if they know anyone who is looking for a dentist. You can also give them a card or two with your information and ask them to give it to anyone they know who requires dental services. Just make sure that you are only asking your long-term patients for referrals, check your schedule before you do so to see how busy you are, and make sure that you don’t turn any referrals they send your way down, even if you are a bit too busy. Turning anyone away could come back negatively on your practice, possibly making the impression that you aren’t taking any new patients. While ensuring that you aren’t overdoing it with your patients by bombarding them with every service you have available, elaborating more on the services you offer is never a bad idea. For example, if one of your patients requires a porcelain cap, it doesn’t hurt to mention all of the other cosmetic dentistry services you offer to see whether or not they’d be interested in another service. If this is something you plan on doing, however, make sure your staff knows about it, too. They’ll more than likely be asked for more information if word gets around, so you will need to make sure that they are ready and able to answer any questions patients, especially potential patients, may have. Nothing is better than receiving an award for doing the bare minimum, which is something you should be offering your patients to help you get more referrals in your office. For example, when a patient of yours refers someone who has booked an appointment with you, send them a thank you note with 10% off their next appointment after you’ve seen the patient they’ve referred to you. Marketing your practice can be a difficult thing to do, especially if you don’t know what you’re doing. 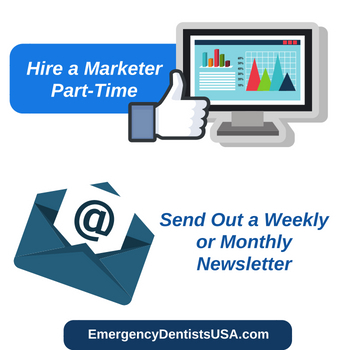 Because of this, hiring a part-time marketer to help you out will help bring more business to your practice the professional way. The majority of dental practices don’t employ a marketing department, but that doesn’t mean you shouldn’t. Even hiring one for a minimum of 10 hours per week is more than enough to get your business bustling with new patients. They’ll help you write a newsletter, manage any social media pages you currently have, give you new marketing ideas. Some of these ideas we’re going to outline for you, but you may need help doing them when you try to complete them yourself, which is perfectly fine! Email marketing is a tool that should never be overlooked, especially by dental practices. In fact, it’s one of the only effective marketing channels that are proven to actually work. You must remember, however, to always have a call-to-action at the end that encourages your patients to make referrals. Your current patients will want to know about any current deals you have on, such as 15% off teeth whitening, for example, so they can pass the information to a friend or a family member who is looking into having such a service done. 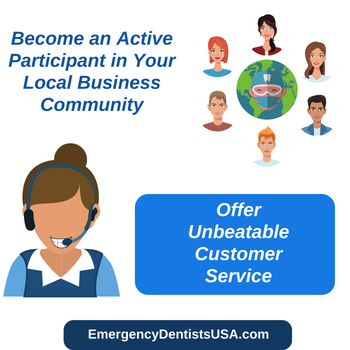 Becoming an active participant within your local business community is another great way to build up a referral network that really delivers. There are about 101 ways you can help your community while also advertising your business while you do it! For example, you could offer 50% of completely free services to veterans. This is doing something incredibly noble for those who fought for your freedom as well as advertising your practice at the same time. If you’re not already offering unbeatable customer service, you really need to step your game up. You’d be surprised how often patients speak to their friends and family about the awesome customer service they receive. For starters, make it as easy as possible for patients to book appointments, which means offering appointment booking both online and in person. Billing, especially, is important. In order to really step up your customer service game, make sure your entire dental team is always greeting your patients with a smile, making sure they’re well taken care of, that they feel comfortable throughout their entire appointment, etc. One of the best ways to get some new patients through your door is to offer something they can’t refuse, especially when it’s paired with something your long-term patients can take advantage of, as well. For example, you could offer long-term patients 10% off when they refer a new patient, who will receive 20% off the cost of their first appointment. It’s a win-win situation for everyone! 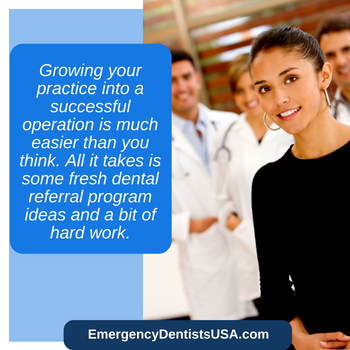 Growing your practice into a successful operation is much easier than you think. All it takes is some fresh dental referral program ideas and a bit of hard work. Within no time at all, you’ll be so booked with appointments you’ll have to extend your hours just to accommodate everyone!